When we have a website that requires user to login or provide any sensitive financial information, how far do our customers trust the website to provide such information? We have come across so many incidents where the credit card numbers are hacked & misused. Do our customers ever verify if the website they’re planning to make payments at are secured & trust-worthy? How do we make sure the customer feels safe to provide these information on our website? To get through all these challenges in business, we need to secure our website with HTTPS. HTTP is the networking protocol that enables the client-server communication over the network. HTTPS is the secured version of the HTTP protocol. S stands for Secured. SSL is a common term when it comes to the security of a website. This is the industry standard to protect websites & its online transactions. Enabling or setting up SSL on our website makes sure the information between the browser and the website is encrypted while transferring over internet. There are multiple DNS service providers who also provide SSL Certificates for the website’s domain purchased through them. Below are the steps to be followed with any third party SSL Certificate provider. Step 1: Configure the server with a unique IP address. Step 2: Generate a Certificate Signing Request (CSR) & a private key for the SSL Certificate and give it to a Certificate Authority (CA). Major CA players in the market are GoDaddy, Comodo, Let’s Encrypt, DigiCert, etc., These third party CAs charge a yearly price for the issued SSL Certificates. For example: GoDaddy costs around Rs.549/- for the first year, followed by Rs. 2,400/- per year. Step 3: Provide appropriate information for the CA to validate your domain. Step 4: CA issues the SSL Certificate after validation. Activate the certificate. Step 5: Install the certificate on the server where the website is hosted. Step 6: Update the website configurations to use HTTPS. Step 7: The SSL Certificates requires to be renewed. Make a note to renew the certificate before expiration. Now, If your infrastructure is hosted on AWS Cloud, you can leverage AWS as a Certificate Authority with the service AWS Certificate Manager. AWS provides a service to ease the process of provisioning, managing & deploying the SSL/TLS Certificates. 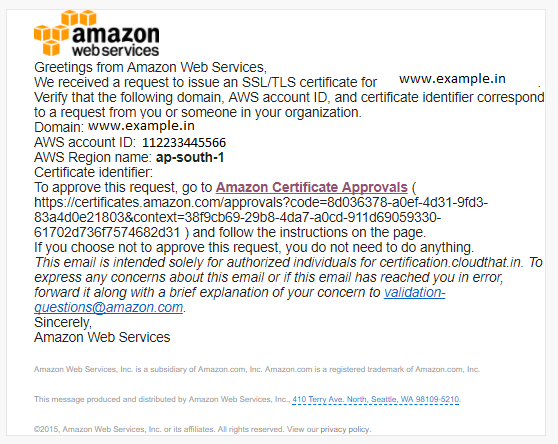 These SSL Certificates can be used for the websites hosted using AWS services. 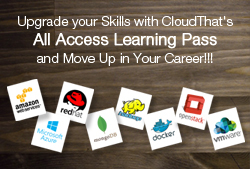 ACM also provides the ability to import the SSL Certificates into ACM & use them in the applications. More than provisioning the SSL Certificate from the third party, the overhead is with uploading, maintaining and renewing the SSL Certificate. With ACM, the management of SSL Certificates is taken care by AWS. If the domain is hosted with Route 53, ACM can directly update the Hosted Zone of the domain with a new record set (CNAME record set). This can be done by clicking on Create Record in Route53 or we can manually update the record set in Route 53. If the domain is not hosted with Route 53, we need to update the CNAME record of the DNS configuration of our domain. i. Choose validation method as Email Validation, if we do not have permission to update the DNS configuration. 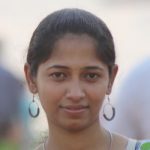 This method will send an Email to all the domain owners for validation. Once the domain owners’ approve, AWS ACM issues a SSL Certificate to that particular domain. 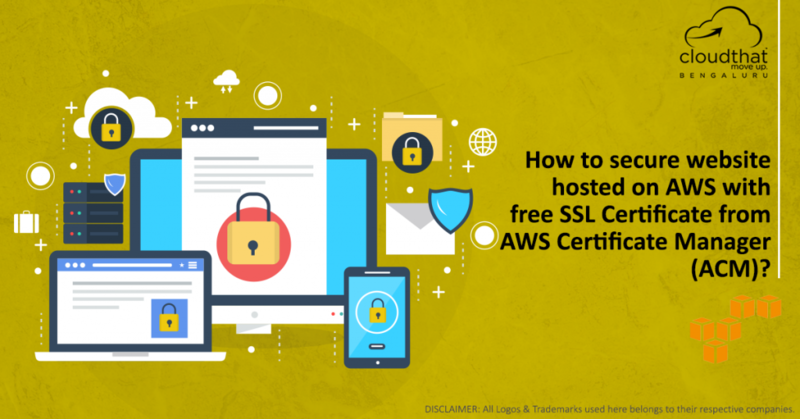 We have used this method to implement SSL for multiple clients whose websites are hosted on AWS. In case you are looking to have ACM setup quicky for your website / application, kindly visit our consulting website, fill up the quick inquiry form and we will get in touch with you within 24 hours. I am doing a project on this. Thanks for posting; Found it very useful!